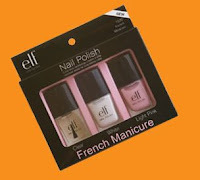 Go here to sign up at Warner's for a free ELF French Manicure kit (I believe you are signing up for an email newsletter..but I'm not positive). While supplies last. Thanks to Jen at Review Retreat ! Stopping by with Marketing Monday. Hope you had a great start to your week.